Strangely, Charli XCX’s 'True Romance' feels like it’s been a long time coming, despite her being only 20 years of age. While the singer broke out with singles 'Stay Away' and 'Nuclear Seasons' in 2011, she had recorded a debut in 2006 which wasn’t released commercially - subsequently describing it as "terrible Myspace music". Since then, Charli XCX has built up a strong internet following, becoming something of a pop saviour for Tumblr and the blogosphere. Having self-styled herself as a goth-pop artist, it’s a bit of surprise that some of her songs are far more closer in style to the pop of Britney, Mariah and Cyndi Lauper than the goth of Siouxsee And The Banshees. As well as the aforementioned singles, there are many other pieces of flawless pop confectionary on the record. On the bitter 'You (Ha Ha Ha)', Charli XCX samples Gold Panda’s 'You' to stunning effects, making it her own. while 'Take My Hand' is commercial dance music at its finest. Having showed her capability to produce earworm choruses, Charli XCX slows down the tempo in the middle part of the record, exploring more emotional territory. While 'Set Me Free' is excellent, there are a few songs in this vein which don’t quite work. 'Grins' just doesn’t really go anywhere, while 'So Far Away' and 'Cloud Aura' seem to have been included for the sole purpose of saying ‘See, I can rap too’. There is a honesty and directness to the songs, which is welcome on the whole but can lead to some clunky, clichéd lyrics such as "Let’s get real high/And never come down". However, when she gets it the balance right between the artificial, electronic sounds and her personal lyrics, the results are potent as on 'Black Roses' which gets the record back on the track. It’s difficult to avoid comparisons with Marina And The Diamonds who also served up a charming debut with some great pop songs. Hopefully Charli XCX will heed the lessons from Marina’s second album, which had all the edges smoothed out in the hope for more mainstream appeal - the result was an album which lacked character. Pop music is arguably becoming a dirty term, with the likes of One Direction, will.iam and Pitbull dominating the charts. 'True Romance' is an assured record, bringing fun, clever songwriting and imagination back to a genre which is solely lacking these features. 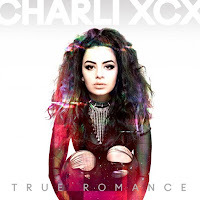 As you would expect, there are some mis-steps but 'True Romance' shows Charli XCX is an artist who should be well worth following over the coming years. 'True Romance' is available to purchase at amazon.co.uk. Find more info at charlixcxmusic.com.